Ano, could of had permanent vision damage, hopefully a full recovery soon though. Looks like something out of a Rocky movie, Adrieeeeene! Poor guy's been done a belter, Ball clearly lunged right into him and if you watch it closely pulls his chin down and goes for the nut on him...or at least that's my interpretation of it. Bunch of greetin faced arseholes Aberdeen are, all elbows and brute force nae football skill...there was only one team trying to even play football on sunday and that was us. All the pally pally *..
No pal goes in to a challenge like that in the air knowing you've no chance of winning the ball but do the player.. He didn't look overly bothered after it either. Moaning about getting sent off..
* me.. he's lucky it wasn't worse though. Looked a really bad one. Watching his nut bouncing off the turf like that was honestly hard to watch..
Tommy25 and \o/ like this. Marty McFly, Tommy25, Slaw and 8 others like this. Been unlucky with injuries, seems to be a quick healer tho. It really wasn't close to being winnable for him.. In my opinion...he has had every excuse in the book rolled out for him since that shocker of a 'challenge'. Other's may see it different but it was disgraceful what he did..
MagicBallBhoy, Tommy25, Westlondonscot and 5 others like this. He'll be a huge miss for the huns game, Ntcham usually tends to show up against them but Christie's drive and attacking threat would work wonders on that hun defence. Love his #fullkitwanker ........ Guys just suffered that and still able to make a joke of himself. Tommy25, ThatBhoyLarsson, Whoflungdung and 2 others like this. Broken cheekbone for him, surely? Looking at that photo there, I agree. No way was that accidental. Dirty * the lot of them on Sunday..
Tommy25, freitassen, Graeme1888 and 2 others like this. It was a straight red card. He was endangering an opponent. The Boyata v GMS is not relevant, that was a challenge by two players going for the ball. This thug went out intentionally to hurt Christie. Boyata/GMS was clearly accidental and a 50/50 challenge.. This is nothing like it. Thuggery is exactly what it was..
Don't forget he * them in the last final this season and I seem to remember McKenna and a host of them giving it to him in a league game this year after a challenge. Their tactics have been going on for far too long. Kick and do anything Celtic related..
We've seen *'s like Logan everytime we play them. Cosgrove trying to end Broony's career. That striker they had the other year who broke KT's jaw in a final no foul. Ferguson permanently out to do our player's. 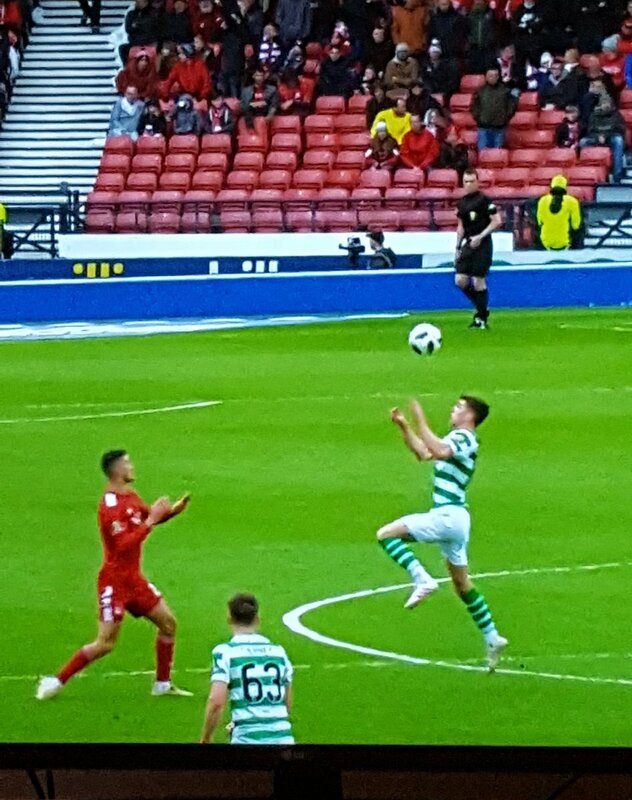 McKenna doing Edouard waist high and no even a foul..
You could go on and on. It starts with that despicable wee mutant McInnes. Just like the Huns, they thought we were there for the taking. He pretty much said it after their nil nil at Celtic Park recently but they were skelped and their tactics fell to pieces.. This is where the rage comes from. The fact we're still the daddies and no one is close.....despite them thinking and hoping they were..
Tommy25, PorchBhoy67, freitassen and 1 other person like this. The fact that McHunnes even brought that up just shows what a total * the guy is, another bitter hun that just canny accept the fact that we're winning everything, both he and his team's conduct was disgraceful. Can you imagine if that was Broony who made the ferguson or tackle, or made the ball challenge ? I'm sure McHunnes would've had plenty tae say, the guy does a lot of talking, mainly through the hole in his * lol. MagicBallBhoy, Tommy25, rhydo1888 and 5 others like this.